In autumn 2013, I was diagnosed with Motor Neurone Disease. This followed months of problems with my legs, resulting in wasting muscles. By the time of my diagnosis, I could only walk with the aid of a stick and not very far at that. As the disease is progressive, even the short term prognosis for my legs wasn’t good. As a person for whom all my hobbies involve walking outdoors, alongside a job which involves lot of outdoor work (I manage nature reserves for the RSPB), this wasn’t good news! 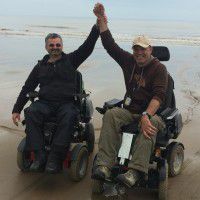 I needed a wheelchair which would replace my legs and get me to the places – hills, beaches, woodlands – where I worked and where I spent my recreational time. However, I wasn’t even sure such a thing existed! After a lot of confusing research on the web, it became apparent that there were only 3 possibilities. I arranged for demonstration trials at my home/local footpaths, to test all three. The decision was a “no brainer” – only the Four X DL SSS (I went for the version which can stand you up straight!) came close to satisfying what I was looking for. So why did I go for it and how have I found it? For a start, Chris, who runs the company, has MS and knows what it’s like to be in a wheel chair and what wheelchair users need. This really helped during the trial and gave me a deep insight into what it would be like to be wheelchair bound and what I needed from a chair to get the most out of life. Furthermore, Chris has always been available on the end of a phone, post purchase to answer my queries and offer advice. Priceless customer service! Being both vain and conscious of still wanting to feel good about myself as a disabled person, the Four X had the advantage of looking “pretty cool” – and Chris will paint t in any colour you want! One of the other chairs looked like a NHS cast off. A critical factor for me was being able to spend as long as possible outdoors without the fear of the batteries running out. The chair has a battery capacity on the flat of 25 miles. 3 – 5 hour trips, climbing big hills, haven’t yet come close to me running out of battery! I have been very impressed by the terrain it can cope with it. It can go up steep slopes (at a much steeper slope angle than the manual suggests), has no problem with mud or sand and can “climb” over pretty big steps and boulders. This has enabled me to take it on so pretty arduous “walks” in the Yorkshire Dales and Peak District. The one thing it struggles with is gravity! So I have learnt that going across slopes at an angle is a no-no! The other thing it does which its competitors can’t compete with is its flexibility of position. Particularly key is its option to raise you up in the sitting position so that you can have an “eye level” conversation with other people. Not yet put the standing function into practice, but i can see the real benefits of having this. At first, the controls are sensitive to touch, but I have gotten used to this quickly and the sensitivity gives me so much more control – vital in the very rough terrains I have been taking the chair. Chris was also really helpful in adding additional systems, such as heat absorbing controls, to the programme. So after only 3 weeks with the Four X I feel that I have recovered a good part of my former life and each day I am pitting it against the next walk it is going to take me on. So far, me and my Four X are winning!